Every Thursday comes with a new word. Only that lately, every Thursday has come in surreptitious* mornings as a scorcher. I am flummoxed. Flummoxed = confused, so that you do not know what to say or do. Flummox is also a verb = to confuse somebody so that they do not know what to say or do (not being used in the progressive). *surreptitious = done secretly or quickly, in the hope that other people will not notice. 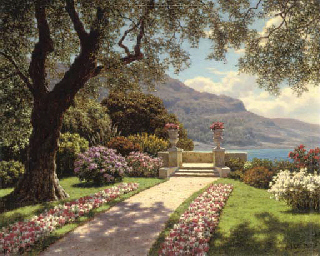 Garden with a sea view by Ivan Fedorovich CHOULTSÉ. Reblogged this on Totul despre IELTS.